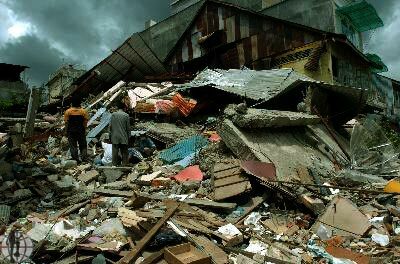 The Tsunami, 26 December 2004 caused a lot of damage in almost all aspects of coastal population life in the tip of Sumatra Island including Nias. Thousands lives taken and lots of infrastructures broken. It also swept the narrow waters habitats, took the livings and silt entered hundreds meters onshore then took its back into the ocean. The giant wave left severely damage behind. In Nias, the forgotten island, the tsunami showed the great force in Sirombu sub regency, the most severely damaged. Not lots of human beings, but infrastructures and the beautiful life of coral reefs. In the central west Nias, it destroyed lots of houses, broke the shoreline wave breakers, and cropped the branched corals pieces by pieces then swept it off to the beach. Luckily for the Sirombus, a 50 meters height hill gave them a place to survive. Otherwise, in Lahewa sub regency, the fringing and barrier reefs and hundreds meters mangroves protected the population from the great disaster. Once again, the good environmental management proved protected the city from the tsunami. Only a few damaged seen in Lahewa. In the others cities in Nias Island, tsunami had no great impacts. The disaster continued. 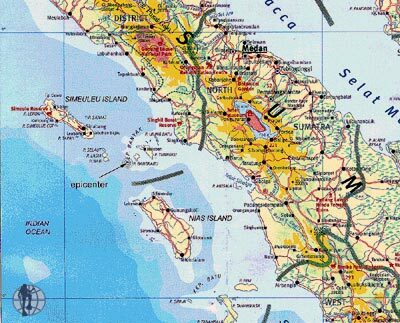 On 28 March 2005, once again The Earthquake shook the tip of Sumatra Island plate continent. While people trying to wake up and develop the broken houses and infrastructures, the earthquake destroyed it. More death and crying heard. The earth quake impacted more severely than tsunami in Nias Island. Lots of houses, churches, mosques, schools and bridges collapsed. Psychologically, the people hurt. Now days, they are living in higher area and left the fisher villages. Only the poor fishers keep staying at the beach and continue their life as usual. Environmentally, the earthquake caused great changes of ecosystems. The west part of the island rose from north to south. Hundreds hectares coral reefs exposed and killed. The Beach got wider. Hectares of mangroves get no more salty sea waters, fishes have no more place for sheltering, feeding and spawning. Underwater, reefs cracked and released from the ocean bottom then reversed by waves. 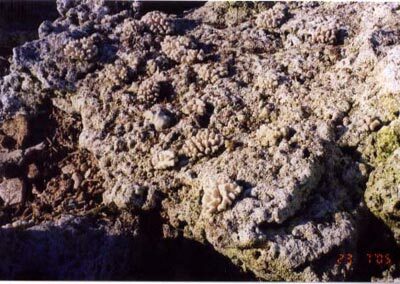 The corals are at the bottom side and the rock upside. More ecosystems changed. Once again, the tropical corals fishes lost their places. This phenomenon is existed in Lahewa offshore. And maybe in other areas that have not surveyed yet. The Reef Check North Sumatra carried out by Lestari Team Marine Sciences in Nias, supported by Jaringan Kerja Reef Check Indonesia and Project AWARE Foundation in July, 2005 proved the phenomenons. 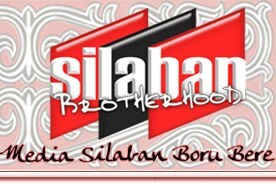 The 26 days survey started in Sibolga and Tapanuli Tengah, and finished in Gunung Sitoli, Nias. In Sibolga and Tapanuli Tengah surveyed 3 sites; Air Terjun and Labuhan Kapal in Mursala Island, and Karang Kasih. The coral reefs condition is at good, bad and very bad levels. Destructive fishing practice using bomb and potassium in the past caused lots of coral damaged in Sibolga and Tapanuli Tengah. Otherwise, Coral harvesting for souvenirs, building materials and boat anchoring at the reefs are responsible for the corals damage. No tsunami impacted to coral reefs found in the areas surveyed. In Nias Island, the team surveyed 5 sites, 2 sites in Lahewa sub regency, 2 sites in Sirombu sub regency and 1 site in Gunung Sitoli. The results, coral reefs condition in those areas are in good, bad and most of them very bad levels. Regarding to the plate continent rising, the team predicted that more than 250 hectares coral reefs have killed. Swept off by tsunami in Sirombu and shook by earthquake in Lahewa.